New Year’s Day kicks off with the Outback Bowl, a matchup of Michigan and South Carolina. Coverage of the Outback Bowl airs on ESPN2 and WatchESPN beginning at 12:00 pm ET from Raymond James Stadium in Tampa, FL. Michigan (8-4) suffered a tough run in the Big 10 losing to in-state rival Michigan State, Penn State and then to Wisconsin and Ohio State to finish out its schedule. Also unranked South Carolina took losses to Georgia and Clemson over its final month of the season. The Odds: Michigan is a 7.5 point favorite against South Carolina. The over/under for this game is 42.5 total points. 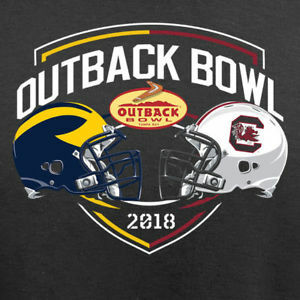 Will it be the Wolverines or the Gamecocks who earn victory in this one?